Before I explain this somewhat cynical answer, I must disclose that I am not a career counsellor, nor do I have much personal experience in finding my dream job (I’m still a student). Nevertheless, I do believe that we can all have a fulfilling career and heaps of job satisfaction (eventually) but we, as early career conservation professionals, must acknowledge that we probably won’t get our perfect job immediately. We will have to go out there, build a career and cultivate our own perfect working environment. Salary: This is self explanatory; the pursuit of employment cannot be separated from the pursuit of payment. Creativity (self-expression): We all want a feeling that our jobs are… well, ours. Nobody wants to do mindless work that reminds them that they are dispensable. Not only do we impose a personal stamp on our careers when being creative, we also gain the intrinsic rewards that come with finding novel ways to solve a problem. A few of us will be lucky to have all three aspects in our first job, but most of us will have to settle for only two. The third missing aspect might emerge with time and experience but, to start with, we should relax our expectations and be willing to be patient while building our careers. I’ve recently met a few inspiring people who were willing to volunteer at international conservation agencies to gain valuable experience and personal enrichment. For them, the chance to be creative and make a difference was worth delaying the gratification of a pay check. Fortunately, many of them have since been promoted to paid positions within a relatively short amount of time, so they serve as good examples that persistence will be rewarded. Similarly, I’m sure you can fill in the gaps of careers with “salary and creativity” (e.g. Fundamental researchers?) 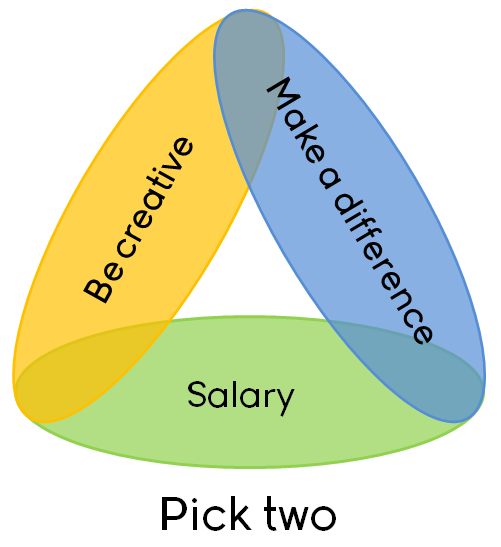 or “salary and the chance make a difference” (e.g. Environmental consultants?). I am also sure that you can imagine how folks in these careers can acquire the missing components once they established themselves in their positions. We may be able to have everything we want in life – just not all at once. We have to be practical, prioritise our goals and choose our own path. These are my thoughts and I am really keen to hear what other people think. I’d love to hear the wisdom and advice of anyone who has already landed their dream job. Likewise, if you’re still searching for that dream job, please share your experiences (or frustrations) in the comments section below. This entry was posted in Conservation careers, People and conservation. Bookmark the permalink. ← Does ecology suffer from the cult of personality? With patience, guts and dreams I think you can get there. First thing, you need to know where you want to go – how else are you going to get there? Ask yourself what qualifications, skills and experience is needed for the position you aspire… Once you know that you can start to set up a path to travel. Even if you don’t know where you want to go, maybe you know where you don’t want to go? That is also valuable, continue trying out other jobs, discover what you like and don’t like. Do you like leading, do you like working with maps, databases, do you like working with people etc? Ideally you should ask people you admire (in roles you want) what their path looked like, but no path is the same, and copying a path does not secure job, as it is sensitive to economy, politics, chance, timing etc. Hopefully your dream career has become clearer now, and you can start the rocky road. Also, don’t be afraid to dream, aiming for the stars, will at least get you to the tree tops! And secondly, communicate your goal, with more people knowing about your target, more eyes and ears are “working for you”, colleagues and friends will potentially see and hear about opportunities. Thirdly; be patient. I am not a patient person, but they say “patience pays” so be tenacious with a clear vision of what you want. For everything you do, you can then ask, if this experience will help you get where you want to be. If the answer is yes – why hesitate? Thanks for the positive advice! I am especially impressed by your second point: Tell as many people as you can. I am generally hesitant to share any crazy ambitions and I’m certain that I’m not alone in my reluctance. Maybe it’s the fear of advertising potential failure? Maybe it’s shyness? I don’t know. But you are right! Other people are generally helpful and willing to assist whenever possible; but they can’t do so unless they are aware of what it is that they can do to help. As for the first and third points – clarity and patience – you are 100% right. I suppose that these come with experience and a lot of trial-and-error. However, we shouldn’t be married to our pre-decided career path. Opportunities don’t care about plans and schedules. While I agree that we should follow our vision, interests and talents; we should also be ready to jump at the once-in-a-lifetime offer once it ambushes us! How will you know that you are not good enough unless you first try? I tell myself that the only true failure is a failure to try. I know it is easier said than done because we all suffer from impostor syndrome and feelings of inadequacy. We are all scared of taking risks, embarrassing ourselves, wasting our other talents and failing. But if something doesn’t scare and excite you at first, then it is probably not worth doing anyway. My only advice is this (Copying what Elisabet commented on earlier): Tell people about your dreams! Surround yourself with encouraging people who share your ambitions. Even if you don’t have the talents to do the job yourself, you could be the one who brings all the other talented people together. You could be the spark that starts something big or the glue that holds the group together. P.S. I’m going to take my own advice and use my next post to explain my own career dream. The very basic reason that conservation jobs pays so less is often because we have not been able to put conservation in mainstream. Lately many conservation organisation have started moving ahead from the model of grant or charity based organisation to service provider. This is a great move and has a potential to absorb enormous amount of skilled people in conservation. If one spots the need that will emerge as this model progress, you would require great deal of skills not only scientific but also managerial skills. Thanks for the comment. I agree with you 100%. The general perception that conservation is a passion-fuelled industry saddens me. I often feel as if conservation biologists are scared of making money because it might tarnish the sacredness of a moral pursuit. We should try to reverse this perception; moving from a charity to a service-based sector is a start. While they have their flaws, the legal and healthcare sectors are leaps and bounds ahead of the conservation movement and we should be willing to learn from them. Becoming a medical doctor, a lawyer or a judge is considered as one of the most prestigious and honourable career choices (wherever in the world you are). At the same time, these are often the most highly-paid vocations. Society has been able to monetise justice and human health (two fundamentally ethical concepts) without it cheapening any moral obligations. Why can’t we also do it with biodiversity conservation? I’ll be writing more on this topic in the future. To get where you want to be you need dedication, hard work, be slightly crazy, and have a great number of contacts to help you on your chosen path. Its not always what you know, but WHO you know. I started out in conservation volunteering at college when I was 17. I decided conservation was the way I wanted to go, so after completing my National Diploma in Countryside Management, I went onto uni to do a degree in Environmental Conservation. During my second year I did work experience with a consultancy, and I really enjoyed it. I was doing something worthwhile and I got paid for it, much more than conservation. Money and job satisfaction was the main motivator for me, to set me on the road to my ultimate dream. So, when I knew where I wanted to go, I went out to get as much consultancy experience as possible. I spent 2 years volunteering and working part-time on a seasonal basis alongside a part-time job. It was hard, particularly financially, but then last year I finally got a full time ecology job based in London. I worked towards some protected species licences, went on courses, joined the local mammal, bat, reptile and botany groups and generally got my name known. However, while the job was satisfying and gave me a great amount of experience, I had absolutely no money because of travel costs and London itself, and no time to do things outside work because of the travel. So, two weeks ago I made the big jump to leave my job and work as a self-employed freelance ecologist. Because of my hard work and dedication over the past few years I can head teams as a species licence holder for newts and bats, and because of all the stuff I’ve done, I’ve gotten loads of contacts. So at 24, I have a job where I can work to make a difference, be creative, be my own boss, volunteer in conservation, and make a decent amount of money whilst still meeting even more people as new opportunities arise. Its taken me seven years, but I am finally where I want to be. Long-term aims and vision is very important (also a little bit of craziness, I think!). It’s very easy to become disheartened when things don’t always go to plan, but that is life. You have to think of other avenues you can explore to get to the same destination. @ Auro – if you never try at something, then you have failed already. YoYou will get nowhere in life and get frustrated BECAUSE you are getting nowhere. You never know until you try. The thing that scares me most is being old and wishing I had done all the things I wanted to do when I was young, but never doing them because I was scared to. Thanks for the encouraging story, Rachel. Even though it took you seven years to get where you are now, I’d be willing to bet that most of us will have to wait even longer… I’m on year 9 already! Nevertheless, my theory is that self-doubt is a much heavier anchor than lack of funds, resources, connections, education or opportunities. Maybe, by showcasing positive examples like yours, the rest of us will finally realise that the satisfaction of taking a risk is much greater than the fear of failure? It takes a long, long time…. I think I just happened to be in the right place at the right time, and circumstances gave me an unwelcome push. It is still a scary thought now. Over the last few days I have been reminiscing and looking back over my very early blog posts, and read the very first one ‘Happy New Year’. On the one hand, I can’t believe how much time has flown by since I realised I wanted to become freelance ecologist and it has actually happened, and on the other, how much has changed over a seemly long time of one and a half years. I read a very interesting blog, the Solitary Ecologist, and one of his posts is about what people look for, or want, out of a job, and what is achievable ‘How To Find Your Dream Job In Conservation’. I am one of the lucky ones, I think – I knew what I wanted to do nearly 8 years ago (albeit working in conservation, not consultancy, but they are similar in the end) – and I have spent the past 8 years working towards my dream. If I didn’t like something, I changed it; either lack of experience in a certain area, lack of protected species licences, the job I was in, the people I was with, or the work I was doing, a lack of money….. (well…. that’s pretty much the whole 8 years :P), most of the time taking leaps into the unknown with no idea whether it was going to work out, only that it felt the right thing to do.